at Saint Louis University today! Follow these simple steps to begin your journey in Alpha Phi Omega! 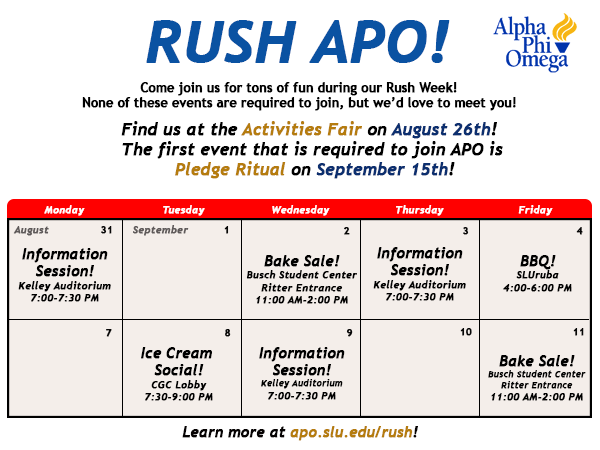 of Alpha Phi Omega, your requirements, why you should join, and how to join! Pledge Ritual (first mandatory event) - Tuesday, September 15th @ 8PM in Ritter 204. Expect to be there until 10PM and please don't forget to bring your $65 for dues and wear business casual attire. Can't wait to see all of you future bros there!! Send us an email at rushapo@slu.edu! for the Spring 2016 semester! Your Recruitment and Pledge Education team for the Fall of 2015 is very excited to get the semester started! We have a very exciting and eventful two week long rush period planned for August 31st through September 11th! We also have an even more exciting overall semester planned in order to teach you about how great Alpha Phi Omega at Saint Louis University is and what being a Brother in our co-ed Service Fraternity is all about! Click here to meet your Pledge Ed team!